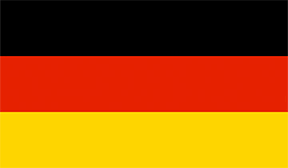 Coffee and tea sets to shop Vernerporc are from Czech producers with traditional quality at the level of quality German porcelain. 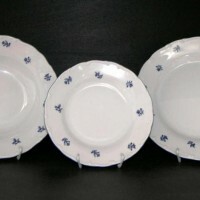 Much of the coffee a tea sets in our portfolio continues the plate assembly a dining sets in our collection. 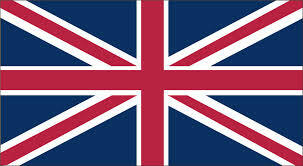 Standard kit coffee sets and tea sets from 1x kettle, 6x cup and saucer, 1 sugar bowl and cream pot 1. 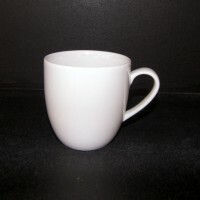 Coffee set is usually content: coffeepot 1.2 l., 0.14 l cup, sugar bowl and cream pot 0.15 liters. 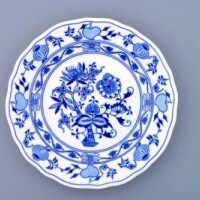 Tea Set is usually content: teapot 1.25 l., 0.2 l cup., Sugar bowl and cream pot 0.15 liters. 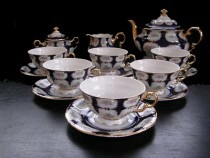 Coffee and tea service is the traditional arrangement for serving coffee and tea at social events. 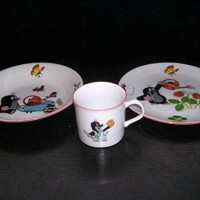 Very glad is used by people who enjoy a refined serving food and drinks. 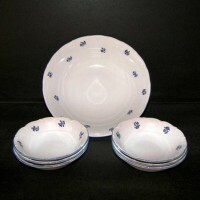 The porcelain coffee set is defined as a set of porcelain dishes for serving hot coffee beverages. The standard porcelain coffee set is standardized for 6 people, but a coffee set for 12 people is also used. 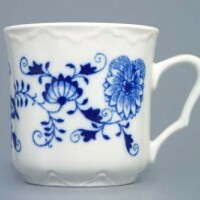 Often, the name coffee service or porcelain coffee service is also used. A coffee set or coffee service is part of our culture thanks to traditional production in the Czech lands. 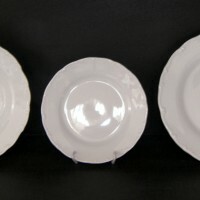 The porcelain tea set has the definition of a set of porcelain dishes for hot drinks - tea. 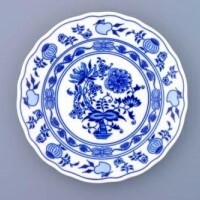 The standard porcelain tea set is standardized for 6 people, but a tea set for 12 people is also used. 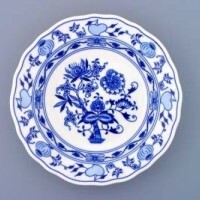 Often, the name tea service or porcelain tea service is also used. Tea set or tea service is part of our culture thanks to traditional production in the Czech lands. 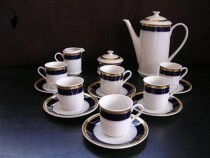 Thun Coffee set Sylvie 85009 15pcs. 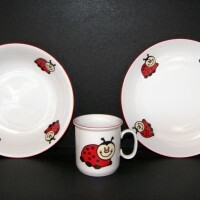 Thun Tea set Sylvie 85009 15pcs. 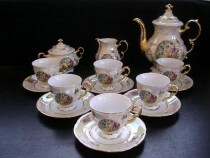 Thun COFFEE SET TOM 3055515pcs. Moritz Zdekauer COFFEE SET GAMA 038 15pcs. Moritz Zdekauer Coffee set Tetra 049V 15 piece. 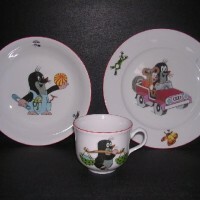 Thun TEA SET TOM 30055 15pcs. 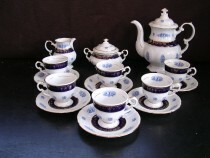 Moritz Zdekauer TEA SET GAMA 038 15pcs. 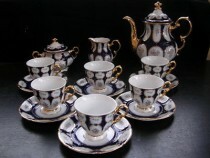 Moritz Zdekauer Tea set Tetra 049V 15 piece. Moritz Zdekauer Coffee set Tetra 046V 15 pcs. Moritz Zdekauer Coffee set Tetra 103v 15pcs. 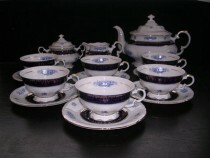 Moritz Zdekauer Tea set Tetra 046V 15pcs. Moritz Zdekauer Tetra Tea set 103v 15pcs. Leander Loučky Coffee set Sonata 158 15 pieces. 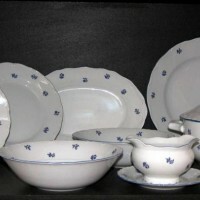 Český porcelán Onion pattern tea set 70507 15 pieces. Leander Loučky Tea Set Sabina 767 15 pcs. Moritz Zdekauer Coffee set original onion pattern 7506 15 pieces. Concordia Coffee set Bernadotte decor fruit 15pcs. Leander Loučky Coffee Set Sonata 1035 15 piece. Concordia Tea set Bernadotte decor fruit 15pcs. Leander Loučky Tea Set Sonata 1035 15 pcs. Thun Future Coffee Set 15 pieces white. 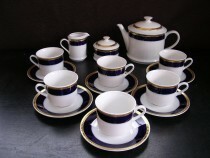 Concordia Coffee set Bernadotte, color ivory / Bern Ivory 15 pcs. 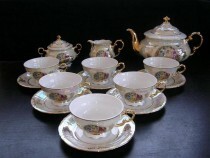 Concordia Tea Set Bernadotte, color ivory, Bern Yvor 15 pcs.